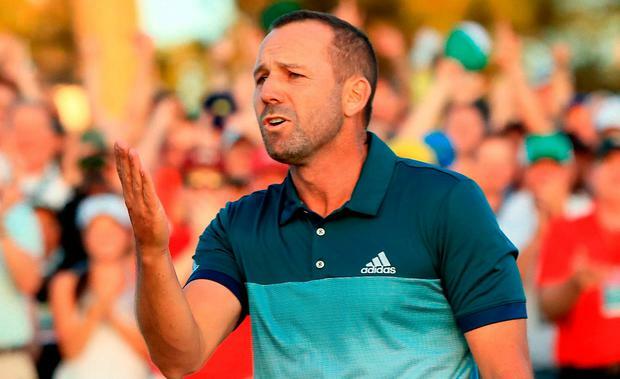 Six-time winner Jack Nicklaus hailed Sergio Garcia's victory in the Masters as "sensational" but admitted he feared the Spaniard was facing more major misery. Garcia birdied the first extra hole to beat Justin Rose in a play-off after the Ryder Cup team-mates had played out a thrilling duel in the final round at Augusta National. It was the 37-year-old's first major triumph at the 74th attempt and came after a number of near-misses in the game's biggest events, including four runners-up finishes among 22 top-10s. "I thought Sergio played very composed, played very well, and he played like he wasn't going to be denied - even after he made a couple (of) mistakes," Nicklaus wrote on Twitter. "He fought his way back into it. Sergio should be very proud of himself. He played like the champion that he is. "It was a great fight between two wonderful golfers coming down the end. Sergio and Justin played great golf. It was exciting to watch... because it was really, really good golf. "I know that two of Sergio's idols have been Seve Ballesteros and Jose Maria Olazabal and I am certain it is very meaningful to Sergio to join them as Masters champions. "It was very special that Sergio could win on what would have been Seve's 60th birthday. That was very appropriate and very nice for Sergio." After seeing an early three-shot lead wiped out by Rose's hat-trick of birdies from the sixth, Garcia bogeyed the 10th and 11th and looked certain to drop another shot following a wayward drive on the 13th. "After what happened at the start of the back nine for Sergio I thought 'Oh no, here it goes again. Is Sergio going to be able to finish?'" Nicklaus added. "Then he made a great five at 13; great second shot at 14; eagle at 15 with an unbelievable shot; had a tough putt he missed at 16; nice par at 17 and a really good shot at 18 and he just misread the putt. "That was pretty sensational for Sergio to get himself back in a position to be in a play-off. And then to play the two shots he did on the play-off hole, they were struck perfectly. Then he made a great putt. Justin played beautifully. Sergio just finished it better than he did. "If looking for a defining moment, I don't think anything would have happened without that par save at 13. Sergio looked like he was going to have a disaster at 13 and then gets out of it with par. "Without that, I think it would have been very difficult to come back, even with the birdie at 14 and eagle at 15. He would have put himself probably too far behind. I think the key was the par at 13. It gave him the energy to do what he did at 14 and 15."